An elegant looking small-scale square cocktail very much in the style of Maison Jansen. 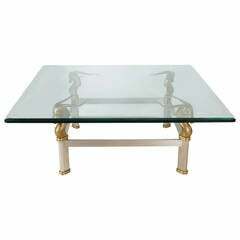 It features a heavy chrome and brass frame with inlaid glass top. In beautiful condition. A chic and beautiful tray table with a faux bamboo base. It features a solid wood ebony bass with brass and glass top surface. An elegant and stylish tray cocktail produced in the 1960s. It features a tortoise print faux bamboo base with brass framed glass tabletop. Offered is a fabulous, 1950s Maison Jansen brass and steel cocktail table, with a glass top. Beautiful detailing with brass fluted finials and framing around the upper. Heavy. Maison Jansen attributed brushed chrome or stainless with brass frame glass top side table. A pair of Hollywood Regency French Maison Jansen brass tables with glass tops. The set is ready for a new home.